Project management is a continuous loop of planning what to do, checking on progress, comparing progress to plan, taking corrective action if needed, and re-planning. The fundamental items to plan, monitor, and control are time, cost, and performance so that the project stays on schedule, does not exceed its budget, and meets its specifications. Of course all of these activities are based on having an agreed upon Work Breakdown Structure (tasks/activities) on which to base the schedule and cost estimates. During the planning phase of a project, the project manager with the assistance of the project team needs to define the process and procedures that will be used during the implementation phase to monitor and control the project’s performance. Productivity in the pharmaceutical/biotech/medical device industry is going down. Some compounds have reached the billions expenditures cost without any guarantee that it will ever be approved or reach the market. So how can we evaluate the performance of some of these clinical trials? I will not go into details in the degree of project management activities managed and performed by a data manager since this can vary widely per company. A good clinical data manager or manager of data management should be able to implement basic PM principles that will improve quality and timeliness of a clinical trial, regardless if the trial is fully outsourced (e.g. CRO performed most of the work). You can find my article about the Role of Project Management in Clinical Data Management (2012) here for further reading. So what is Estimate at Completion or EAC? or What is the project likely to cost? There are several methods we could use to calculate EAC. Let’s look at one formula. 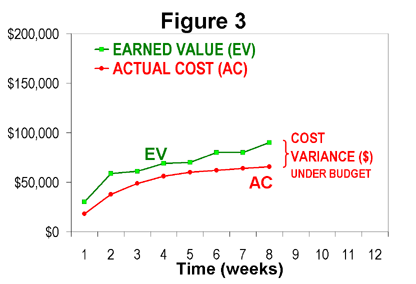 EAC = AC (Actual Cost) + ETC (Estimate to Complete) so what happens when you don’t know the ETC? We could use the following formula to derive that value: ETC = (BAC – EV) / CPI =>>>>??? So what? More formulas? How do I get BAC or EV or CPI? Let’s look at those in more details. At the end of the first week, the CRO reports that he has enrolled 20 subjects and the actual cost of that study is $450. With this information we can look at schedule and cost variance. SV = $400 – $500 = – 100 ($100 work of subject recruitment is behind schedule). These rations can be used to estimate performance of the project to completion based on the early actual experience. If nothing changes, based on the actual results at the end of the first week, the study is estimated to cost $2248 (rather than the planned cost of $2000) and will take 20 percent longer. The formulas assumes that the accumulative performance reflected in the CPI is likely to continue for the duration of the project. You do not need to memorize all of these formulas. There are plenty of tools in the industry that does the computation for you. But if you do not have it available, you can use Excel, set-up your template and plug in the numbers. As per PMI – PMBOK definition, Cost management “…includes the processes involved in estimating, budgeting, and controlling costs so that the project can be completed within the approved budget.” A Guide to the Project Management Body of Knowledge (PMBOK® Guide). We have shown you, that PM tools such as Earned Value Analysis, can be applied to clinical trials or specific work break down (WBS) activities within the data management team. Based on the above outcome of the project performance related to the schedule, the data manager should be able to determine if she should modify the current plan or revise the original plan. It is a perfect tool for data managers and managers of data managers and could be part of your risk based processes. If bringing efficiency, improving data quality and significantly reducing programming time after implementing CDISC standards is on your radar screen, I’d love to chat when it’s convenient. All the best. Anayansi Van Der Berg has an extensive background in clinical data management as well as experience with different EDC systems including Oracle InForm, InForm Architect, Central Designer, CIS, Clintrial, Medidata Rave, Central Coding, OpenClinica Open Source and Oracle Clinical. SAS, CDASH/SDTM (CDISC standards implementation and mapping), SAS QC checks and clinical data reporting. A Guide to the Project Management Body of Knowledge (PMBOK® Guide). Our consultants are recognized for their experience, capabilities and knowledge. RA eClinical Solutions dedicates a Professional Project Team to your project to assure its success. Our team provides expertise in eClinical and eCDMS study design and implementation. Our primary goal is to work in collaboration with our clients to provide systems and services that meet their business needs, while ensuring complete compliance with all applicable U.S. and International regulations and guidelines. The Electronic Clinical Study Project Management Life Cycle (ePMC™) provided by our eClinical Team is a validated process covering every aspects of the project management life cycle. The process manages the various stages of the study, including: Project Initiation, Planning, Execution, Monitor / Control, and Closeout. RA eClinica is a established consultancy company for all essential aspects of statistics, clinical data management and EDC solutions. Our services are targeted to clients in the pharmaceutical and biotech sector, health insurers and medical devices. The company is headquarter in Panama City and representation offices with business partners in the United States, India and the European Union. For discussion about our services and how you can benefit from our SMEs and cost-effective implementation CDISC SDTM clinical data click here. A phase II study was being managed by a CRO that had non-dedicated teams, escalating costs, with project timelines slipping on almost every deliverable. RA eClinica assumed responsibility for entire data management activities consisting of Data Management, Study Build / EDC Development, and Statistics and Programming. RA eClinica Solutions (Technology Resource Organization), is your best source for customized solutions. We focus exclusively on clinical drug development in the bio-pharmaceutical industry, we addresses a highly specialized need in an extremely large and growing market with an avid demand for qualified personnel. RA eClinica combination of clinical trials development expertise with technology integration and recruiting resource, allows each of our clients to ‘custom design’ their required needs. RA eClinica collaborate with each client to develop a solution with our experienced ‘SMEs’ of professionals. Each team is trained in a specific functional area to ensure that each of our clients’ need are met. This approach differs from the turnkey approach of Clinical Research Organizations (CRO) employment and the low value-added commodity style of general staffing / recruitment firms. If you are looking for contract staff (short and long term), permanent staff, “contract to perm” employees or project team deployment, let us help you find the right candidate. Take advantage of everything that RA eClinica Solutions has to offer you. My colleagues and I look forward to the opportunity to work with you in the near future. Learn the basics on how to implement CDISC data standards concepts on your clinical trials from study design to FDA data analysis submission. Need SAS programmers, CDISC Subject Matter Experts (SMEs) or a clinical programmer? We can help provide resources in-house / off-shore to facilitate FDA review by supporting CDISC mapping, SDTM validation tool, data conversion and CDASH compliant eCRFs. The Sponsor required a solution to effectively manage and control users (internal and external). Develop, deploy and host the clinical documentation service and provide customer support. Development of an electronic tool to manage the program and provide ongoing operational management support..
Reports are made accessible based on permission on a web browser CFR-Part 11 compliance is maintained on security and privacy of data. For discussion about our services and how you can benefit from our SMEs and cost-effective implementation CDISC SDTM clinical data click here.